Avaya Engage, co-hosted by Avaya and the International Avaya Users Group (IAUG), is taking place this week in Austin, Texas. It’s the premier event for Avaya customers and resellers, with their primary focuses being to learn about new Avaya products and to network with peers. However, Engage is also the place to hear from Avaya’s executives about the state of the company. At least year’s Engage, Avaya CEO Jim Chirico had only been in that position a few months, so he could only talk about what changes he was planning on making. During this year’s keynote on Monday, he spent much of his time discussing what he did over the past year and what other work needs to be done. Before I talk about highlights, I’ll note that one of the aspects I liked about his keynote is that he never mentioned the bankruptcy. He gave no more explanations and apologies, reinforcing that Avaya has moved forward and the industry, including competitors, needs to do so as well. What Chirico did do during the keynote was spend some time with a bit of chest-thumping when he talked about Avaya’s biggest asset -- its customer base. I’ve always felt the size of Avaya’s customer base, coupled with the fact that most of the world’s largest companies use its products, gives the company an experience advantage that competitors can’t match. That being said, sitting on your hands and taking the customer base for granted doesn’t do any good. During his keynote, Chirico cited NFL legend Peyton Manning, himself a day two keynoter, as saying: “If you wait for others to change, you will automatically become a follower.” This axiom eis easy to say and harder to follow, with change being uncomfortable and difficult. This is where Chirico switched gears to talk about where Avaya is going, making the commitment that, under his watch, Avaya will be a customer-led organization. I liked his admission that in the past Avaya was technology-led; it developed cool products and hoped customers would buy them. This is never an easy thing to come to terms with, but Chirico made no qualms about it and said change was needed. The product-first strategy caused the company to “miss the mark” on a number of market transitions and created the whole mess it just worked its way out of, Chirico explained. Of course, any company can talk the talk of being customer-led. Walking the walk is more important, and Chirico provided a high-level look at Avaya’s plan for doing just that. To illustrate his point, Chirico showed a slide with older product names from over the years -- Oceana, Breeze, Equinox, Intelligent Wire, and Equinox, for example. If you’re familiar with Avaya, these names might make sense but if you’re not, then they have no meaning. To change this, Avaya has a new naming convention. It’s moving to a model through which it will deliver “Intelligent Xperiences,” or Avaya IX, from the Avaya OneCloud. 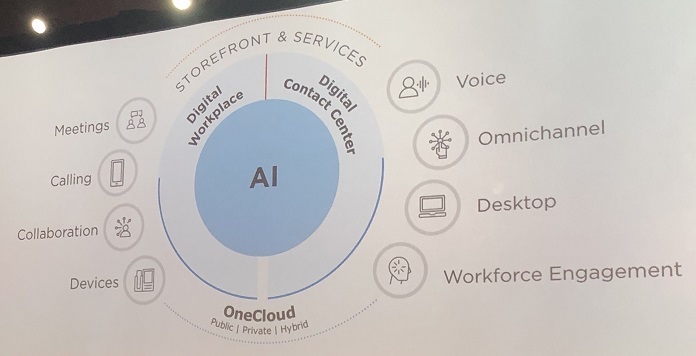 As you can see from the graphic below, Avaya has built OneCloud off a common core and can deliver UC and contact center services in private, public, or hybrid cloud configurations. Artificial intelligence (AI) sits in the middle to indicate Avaya’s use of AI as a way to create differentiated experiences. In my opinion, Avaya should flip the position of AI and OneCloud; OneCloud is the offering and AI enhances it. Regardless, the point is clear that the separate development silos, product names, and go-to-market models will give way to something simpler that is easy for everyone to understand, including companies not yet familiar with Avaya. As part of the simplification process, Avaya is aiming to make its solutions easier to buy. Evidence of this can be seen in the launch of its online storefront, through which customers can purchase different packages and have clarity into pricing and a feature breakdown for each plan. Even the names of the bundles are direct and indicate what type of user would benefit most. Being at Engage gave me the opportunity to catch up with some of the channel partners and sales engineers I’ve gotten to know over the years, and all of them confirmed what Chirico stated. Avaya is listening more than it ever has, they told me. Instead of presuming to know all the answers, it’s turning to the people that sell and buy the products to learn and align its strategy around that feedback. Another anecdote that supports the customer-led approach comes from Eric Rossman, who runs Avaya’s DevConnect and A.I.Connect programs. When I mentioned to him that A.I.Connect seems to be growing slowly compared to the first year of DevConnect, he said Avaya is being careful about which companies to add as partners as it only wants solutions that are business relevant (see last week’s No Jitter post, “Avaya Expands It’s A.I.Connect Ecosystem”). While he has come across some cool vendors, he said he thinks to himself, “’Is this something company X would deploy?’” If not, Avaya takes a pass and moves on to evaluating the next vendor in the long line of candidates. It’s important to note that the job is far from done, and Avaya has plenty of work ahead on making its products easier to understand and faster to deploy. On the engineering side, there’s a tremendous amount of engineering work being done to bring implementation times down. For example, the older version of IP Office would often take weeks to stand up as a private cloud. Now with a container-based Google Cloud Platform solution, a customer can turn up IP Office literally in minutes. And on the marketing side, the company is working on finalizing how the old product names map to the new OneCloud model (but appears to be close to finishing). In this fast-paced digital world, things change quickly and companies that build products based on market assumptions will eventually fail. All the best companies in the world are customer-led. Microsoft is a great example of the this. Under former CEO Steve Ballmer, the technology-led organization made bad decision after bad decision. The version of Microsoft headed up by current CEO Satya Nadella listens to customers and has enjoyed much better results. Avaya appears to have made this same technology-to-customer pivot. We’ll see over the long term if it can maintain it… but so far, so good.